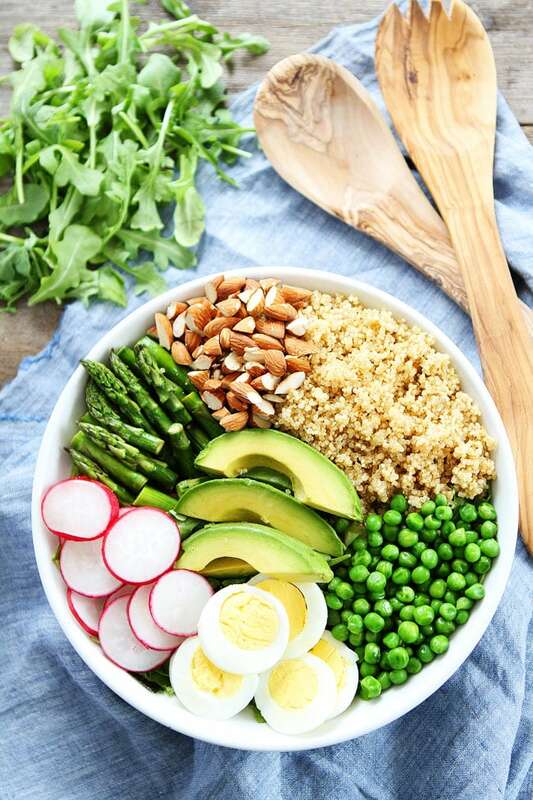 Spring Quinoa Bowl-this simple and healthy quinoa salad bowl is perfect for spring! Did you have a nice Easter weekend? I was in Waco, Texas for most of the weekend for a fun Fixer Upper trip. I had so much fun and will share a trip recap soon! I didn’t want to miss Easter with my favorite boys so I came home late Saturday night. On Easter Sunday, we hunted for baskets and eggs that the bunny left for the boys. We also went to church and made a special Easter brunch and dinner. It was a great day! But now, I am wondering what I am going to do with all of the hard boiled Easter eggs that are in our fridge. Josh and the boys dyed eggs while I was in Texas and they are quite the artists. The eggs are so colorful and fun, but there are a TON of them! I plan on making Avocado Egg Salad, my favorite egg salad, and traditional Egg Salad, Josh’s favorite, but you can only eat so much egg salad. 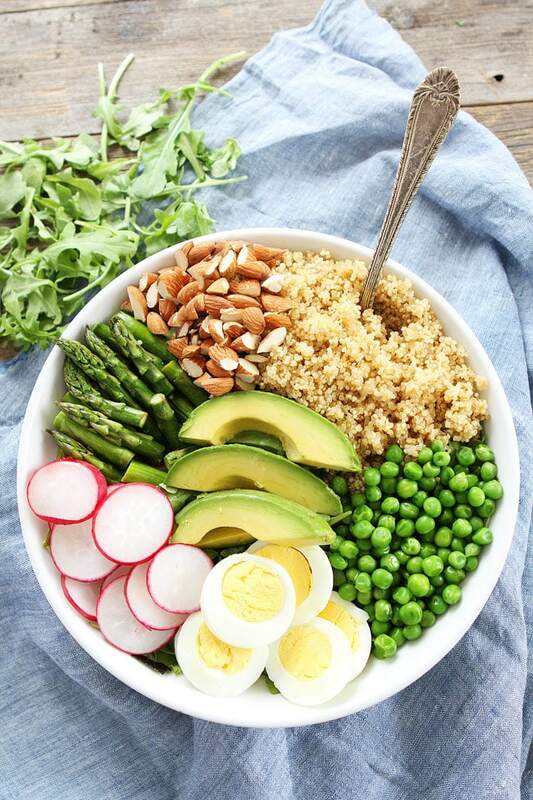 To help make a dent in our hard boiled eggs, I am going to make this Spring Quinoa Bowl for lunch today. 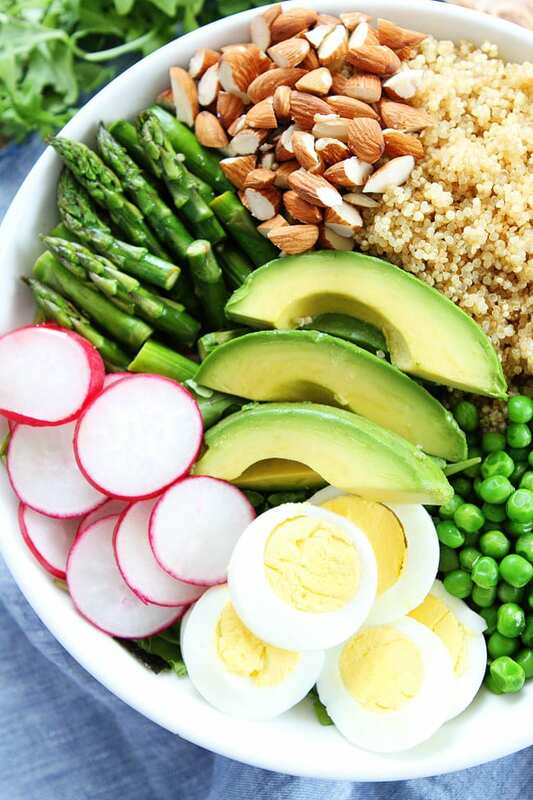 This quinoa bowl is loaded with all of my favorite spring things! Just looking at it makes me happy. It is such a pretty bowl! I love all of the green. The bowl starts with a bed of arugula. 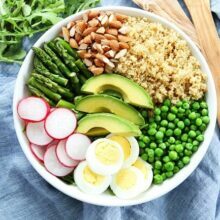 On top, I add quinoa, asparagus, radishes, hard boiled egg slices, peas, avocado, and Blue Diamond Whole Natural Almonds. I drizzle a simple lemon dressing over the top and dig in! All of the flavors, colors, and textures come together to create one big bowl of goodness! I love everything about this salad. 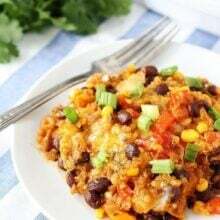 It is great for lunch or dinner and it will leave you satisfied and feeling GOOD! 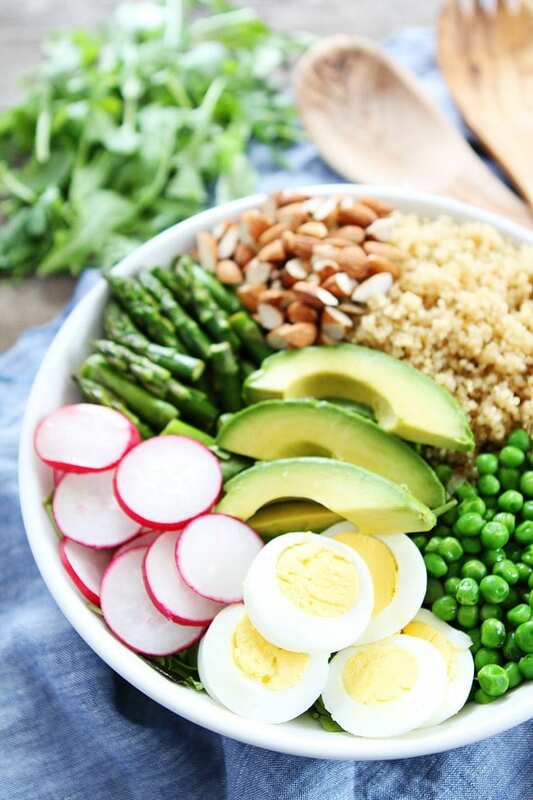 This Spring Quinoa Bowl is the perfect healthy meal for spring…and a great way to use up some of those hard boiled Easter eggs! Enjoy! 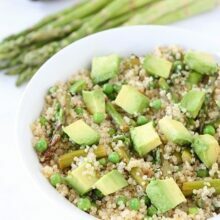 This simple and healthy quinoa bowl is the perfect meal for spring! In a small bowl or jar, whisk together the olive oil, lemon juice, vinegar, garlic, honey, salt, and pepper. Set aside. Place the arugula in a salad bowl. 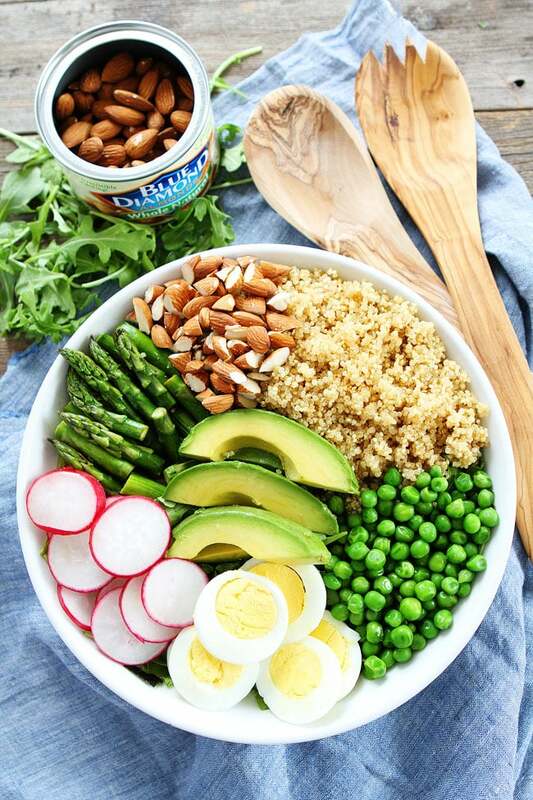 Top the arugula with the quinoa, asparagus, peas, radishes, avocado, egg slices, and almonds. Drizzle with dressing and season with salt and pepper, to taste. Serve immediately. Note-you probably won't use all of the dressing. Store leftover dressing in a jar in the refrigerator for up to one week. I usually make this salad when I have leftover asparagus, quinoa, and hard boiled eggs so it doesn't take long to put together. You can cook everything the same day and it still won't take too long. Make extra so you can eat it a few days in a row for lunch! 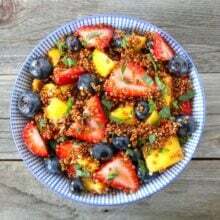 I love quinoa bowls! I love the combinations you’ve made, it sounds perfect for Easter. I definitely need this bowl in my life! Love the springtime feeling it evokes! I’m always ready for a spring bowl, especially if it looks like this! Its a complete health package in a single bowl. beautiful pictures. 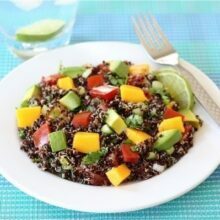 This quinoa bowl embodies spring! It’s making me hungry for lunch! This is a perfect spring salad and a great way to use up those eggs! Love this fresh spring salad! Love healthy and nourishing power bowls like this! Definitely a recipe I need to make. Now this is one gorgeous salad!! Want! Who wouldn’t want a bowl of this quinoa? It looks beautiful, and quite delicious I might add. I would certainly like to try it out for a special occasion. All I can say is this, as far as beautiful salads go, this bowl is among the best I have seen.